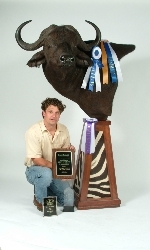 Started taxidermy in 1996 where he attended a one year taxidermy college in North Carolina. Major Award Winning Taxidermist (multiple times over) . Avid hunter/fisherman . Married to his beutiful wife, Amanda since 1998 , they have since been blessed with a wonderful son, Tristen, born in 2004. Shannon is a Christian and veteran of the US Army. 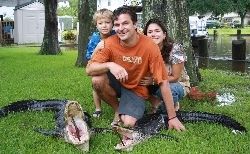 This is a photo of myself , wife Amanda, and son Tristen on our 2010 Louisiana Alligator hunt with Safari Unlimited . It was a first harvest for both Tristen and Amanda, Tristen's was 6' and Amanda's was 8'. The trip was a incredible, everyone had a blast, I highly recomend it to anyone. Check out www.safariunlimitedllc.com , and contact Drake Dawson. Shannon Ostertag with son Tisten. 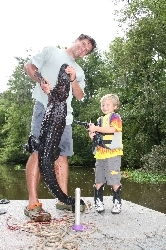 This 6' gator was harvested by Tristen as his first trophy animal. 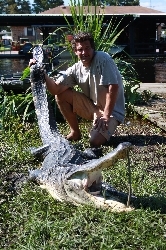 Hunted in Louisiana 2010 with Safari Unlimited , www.safariunlimitedllc.com . Great hunt !! I highly recomend it to anyone ! !